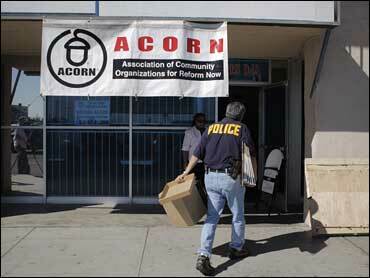 The Association of Community Organization for Reform Now or ACORN, and two key officials were charged on Monday with 39 counts of voter registration fraud in Nevada, stemming from allegations that they paid canvassers to submit fake registration forms during the 2008 Presidential race. Along with ACORN, Christopher Howell Edwards, the Las Vegas Field Director and Regional Director Adele Busefink are accused of compensating employees with a payment structure, that according to the complaint, provided an incentive for registrants to fill out phony forms, illegal under Nevada State law. The complaint details what authorities called ACORN's "blackjack" bonus program, where representatives were paid an additional five dollars if they registered more than 21 voters per shift. Nevada Attorney General Catherine Cortez Masto who filed the charges told CBS News they are now taking action, to "stop this type of activity, so that in future elections this process will be cleaned up." Of the more than 91,000 people ACORN registered in Clark County, Nevada, which includes Las Vegas, 28,097 were duplicates and 18,947 did not match motor vehicle or social security records. The bogus names included Dallas Cowboy players Tony Romo and Terrell Owens, and Disney characters Mickey Mouse and Donald Duck. In a statement, ACORN spokesman Scott Levinson told CBS News the organization does not pay employees on a "bonus or incentive system" and that ACORN brought all suspicions of voter registration fraud to the attention of Nevada election officials. He also called the charges "the latest in an ongoing assault designed to blame the victim and prioritize media grandstanding about the pursuit of justice." CBS News reported extensively on voter registration fraud during the election season, but found no evidence of a link between fraudulent registration forms and actual voter fraud. If convicted, Edwards and Busefink could face up to four years in prison and a 5,000 fine.